Gives details of the blues, rhythm and blues, gospel, country, rockabilly, and pop recording sessions undertaken by Sam Phillips in his studio at 706 Union Avenue, Memphis from 1950 when the the studio opened, tot its closure in 1960. Details are given both for recordings by the Memphis Recording Service and by Sun Records. The file also includes significant events relevant to recording in Memphis during those years. 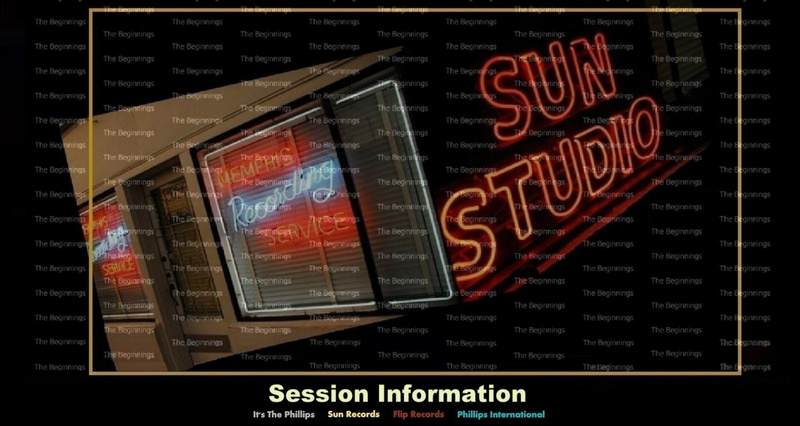 The session details contained here were taken initially from two sources; the personal artist files kept by Sam Phillips and Marion Keisker for the Memphis recording Service and for Sun Records; and details of recording sessions submitted to the Memphis Local of the American Federation of Musicians. In some cases these written records are incomplete or even missing and some of the exact recording dates and personnel are therefore unavailable. There were some typing errors on the original files which we have corrected where they were obvious, and there remain other anomalies such as personnel listing that do not exactly coincide with the music that has survived on tape. However, with the above qualifications, the written records of these sessions are for the most part demonstrably accurate. Where possible and where we are reasonably sure of the fact,s we have supplemented the information from the files with details gleaned from interviews or from aural evidence. We have endeavored to include reference to all the blues, rhythm and blues, gospel, country, and rockabilly, and pop artists recorded by Sam Phillips. Not only the artists who recorded for Sun, but also those whose music was leased by the Memphis Recording Service to 4-Star, Modern, RPM, Chess, Checker, Duke, J-B., or Trumpet Records. Inevitably there will have been omissions where tapes and information have become lost or obscured over the years. However we believe that the great majority of artists who passed through 706 Union Avenue in the 1950s are included in the Session File. Has been organized on a chronological basis, month by month, and is interspersed with month by month entries of supporting information relevant to record releases, licence deals, chart action and the Sun story generally. Where the exact day or month of a recording unknown, the entry has been slotted into a position indicated by other evidence, such as the record release date. It is immediately obvious that there were periods each year when there was little or no recording activity at 706. This reflects the fact that Sam Phillips was the sole recording engineer there until the end of 1956 and recording activity ceased while Sam was out of town on promotional business. It is also noticeable that recording of black music slowed in 1954 as Sam Phillips moved into country music, and reduced significantly after July 1954 with the release of Elvis Presley's first record on Sun. For those sessions where one or more recordings are included here, we have listed the recording date and the name of the principal artist, all songs titles recorded, and all musicians involved at the session. For other sessions where the recordings are not used here, we have referred only to the date of the session and the name of the principal artist involved. Where recordings are included here, their titles are shown in bold red letters and than referred to composer, publisher, matrix number, first release date and the reissued CD date. The spelling of song titles and names is based on those appearing on the original record labels or in the session files. In many cases, more than one take of a recording has survived on tape and some of these alternate versions are included here. Other alternatives have been issued elsewhere but all those alternative versions have been listed here. We have normally omitted reference to songs that have survived in an incomplete form. The names listed for a session include all those who appear to have been used at some time during the session. We do not imply that all musicians are playing on all titles within the session. We have listed the matrix numbers used for the record releases on Sun and other labels. However, Sam Phillips had no real system for indexing the product of his relatively informal recording sessions and the original unissued songs cannot be numbered in this way. The record release numbers quoted at the right margin refer to the original legal release of a recording on 78 or 45 rpm singles during the 1950s. We have here listed the subsequent re-release of these titles on LPs and CDs. Where a song from a session was not an original 78 or 45 rpm release, but was released on one of the plethora of LPs and CDs issued in the years after 1968 when the original Sun label was sold, we have described the song as ''Not Originally Issued''. Where a song from a session has not appeared at all we have said it remains ''Sun Unissued''. Where a song has not been issued anywhere, the words ''Previously Unissued'' have been used. The Ampex Model 350 C magnetic tape recorder is a two-speed audio recorder designed for use with standard ¼ inch tape. The Model 350 is available in console, two-case portable, and rack-mount styles, all with either full or half track heads. Independent record and playback systems allow the tape to be monitored while recording. A phone jack is provided to monitor either the record input signal before or during recording, or the output signal from the playback head while recording or during playback. An A-B switch is incorporated in order that direct comparison can be made between the original program and the recorded program. The same switch transfers a 4 inch VU meter for level comparison and monitoring. The VU meter is also used to read bias and erase current. It was on this machine (serial number 54L-220) that Elvis Presley, Carl Perkins, Jerry Lee Lewis end many more was first taped. Marion Keisker used the Ampex 350 C (made in Redwood City, California) to tape the last third of "My Happiness" and all of "That's When Your Heartaches Begin". The control panel connected to the tape recorders was made by RCA. Had a equipped with a portable, five-input Presto mixing console and amateur Crestwood and Bell tape recorders. These were soon supplanted by a portable Presto PT900 machine; yet, unsure about the quality and durability of tape, Phillips recorded most of his earliest commercial efforts to 16-inch acetate discs, cutting them at 78rpm with a Presto 6N lathe that was hooked up to a Presto turntable. Still, it was another setup that subsequently helped endow both Phillips and Sun Records with legendary status. The RCA 76-D Radio Console that replaced the Presto embellished the recordings with a warmth that emanated from inputs and outputs coupled through transformers, while three of Ampex 350 tape machines helped create the famous Sun sound, by bouncing the signal from a console model to the rack-mounted version with a split-second delay between the two, Phillips achieved the slapback effect that generations of successors would strive to imitate. The RCA 76-D console (serial number 1011) was previously used in a Florida radio station. Sam Phillips used the monaural console to the end of 1959 at the old Sun studio at 706 Union Avenue. Most of the recordings at Sun were literally made with five microphones, which included a RCA 77-DX, Shure 55-S, RCA 44-BX and an Altec Lancing pencil mic (more likely a 21B ''coke bottle''). The RCA 44-BX microphone and 77-DX (introduced in 1954) Poly-directional microphones are high-fidelity microphones of the ribbon type that are specially designed for broadcast studio use. The Shure 55-S has all but become synonymous and easily identifiable as ''the Elvis mic''. Most of these microphones at the time were bought in abundance for the military and could be picked up used as surplus very cheaply. Sam Phillips worked with how each different vocalist would work the microphone. Some he'd have directly in front, maybe six inches back, others he would have work across the mic. Sam never used EQ (equalization), which is adjustment of frequency response to obtain a desired quality of sound, until they got the mastering stage. He had a homemade compressor that he made in case something got out of hand but he had very little limiting and compression. Compression is used to control or smooth the volume peaks of an input signal to deliver a more even signal while a limiter reduces the volume or gain of a signal to prevent overload. Though he did his own mastering early on he eventually would have Bill Putman and his wife at Universal Recording in Chicago do most of the acetate mastering. He felt that the one deep-cutting head on the Presto lathe that he had just wasn't adequate to get the level that he needed.